Star Trek was adapted to video game (or, at least, electronic game) form at something close to Warp 14 (Original Cochrane Unit scale) and has seen titles, official and unofficial alike, at least every few years in the four decades since. Seriously, four decades. Star Trek‘s been in video games twice as long as Mario. As best I can dig up, though, a properly licensed Star Trek game didn’t crop up until the years of vector graphics, initially to coincide with the 1979 release of Star Trek: The Motion Picture. 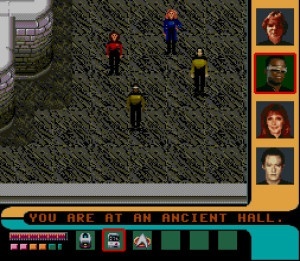 Most notable amongst these was probably 1983’s Star Trek: Strategic Operations Simulator, an arcade shooter that associated itself with the Star Trek movies of the time and even used synthesized speech and was ported to numerous home computer systems. Through the 1980s, Simon & Schuster Interactive released several text adventures, which I’m told are quite good in some cases (ports exist, and I’ve tried some, but I don’t quite seem to grok the interface of really old school text adventures so well as I might like). Each title – like The Promethean Prophecy and The Kobayashi Alternative – played out like a classic Trek adventure with Kirk & crew. They even dabbled in the realm of The Next Generation, then brand new, with The Transinium Challenge in 1989. Looking back at these adventures is interesting because Trek games grow up through this period of slightly more graphics, slightly more non-puzzle-based gameplay with each iteration. Regrettably, the same can’t be said for the movie itself. Although I missed out on the NES title that did make it to release – Interplay’s befuddling Star Trek: 25th Anniversary – I was all-in for the release, two years later, of Star Trek: The Next Generation: Future’s Past for the SNES, a fairly meaty, galaxy-spanning (and sometimes befuddling) adventure with the crew of what was, by then, the well-established mainstay series of a multi-series franchise. Future’s Past was a bit over my head at the time, for a few reasons, but I’ve played it in more recent years and it is…well, unique, to be sure. The most exciting thing about it is how it feels like an interconnected series of episodes from the show, with different missions combining time on the Enterprise-D, action-oriented away missions, and puzzle solving to weave a running story about the race to obtain an Ancient MacGuffin Device. (This is called an Integrated Field Derandomizer, or IFD, in the game, but even in the sparse console-game text that feels like a bit of a tongue-in-cheek conglomeration of technobabble. Though I suppose anyone can see why it would be bad to have their, uh, integrated fields…derandomized.) The game makes good use of the show, including using digitized images of the cast and sets for some screens, and despite the fact that it’s not terribly wordy as adventure games go (though still pretty wordy as SNES games go) it manages to get across the story, such as it is. 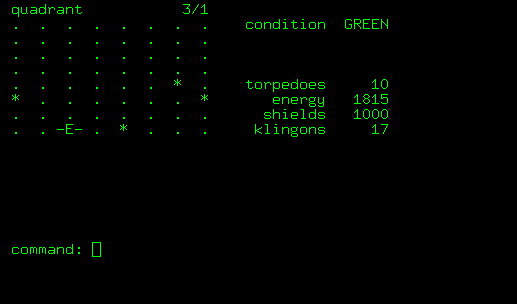 You could be forgiven for thinking that, at the time, this was the closest you’d reasonably come to feeling like you were part of the crew of the Enterprise, especially if the text-based games felt lacking in the aesthetics department. Because these graphics are Riker-level sexiness. Some of the missions were pretty neat. You could choose your away team of four people from amongst a selection of the main cast and a bunch of random officers (put there, I suppose, in case you didn’t want to risk the important people, who could be eliminated from the game if they were injured), and different crew members would come with different gear. You controlled one at a time in a top-down manner, and could have the others follow along behind you, lemming-like, or just hang out to be murdered off-screen (if you weren’t careful). Missions also made good use of certain characters’ unique abilities: in one mission, the away team beams into a series of mining tunnels where the ventilation systems have been deactivated, and only Data’s not-needing-to-breathe let you quickly reactivate them (unless you are sadistic, in which case you can just watch the away team stand there and perform some synchronized suffocating); in another mission, Geordi’s VISOR allows him to see in the dark when you beam to a derelict ship: it’s much easier to get the power back on with his night vision to keep you from bumping into crates and killer security drones. The main thing that makes Future’s Past almost tragic is that it is one of the last Trek games that felt different from anything else out there at the time, especially on consoles. For all its flaws, you can’t play Future’s Past and come away thinking, “That’s not at all like Star Trek.” Unfortunately, before long, most Trek games would garner exactly that reaction. Star Trek: Deep Space Nine would get the Genesis/SNES treatment in 1994’s Crossroads of Time, which was developed by completely different people and had nothing in common with Future’s Past. It was, though, an interesting side-scrolling platformer that involved a bit less shooting things with phasers than you might expect it to. But there was something waaay more interesting from Interplay that year, the Sega 32X/SNES title Star Trek: Starfleet Academy Starship Bridge Simulator. Shockingly, one of the best Star Trek games out there is probably the SNES Starfleet Academy. A precursor to the more well-known, bigger budget, much buggier PC title in which Interplay reused a lot of the same concepts, SASBS (“saasbzz”) is a little ugly to look at now, but for the hardware involved, its polygonal ship models were pretty impressive and plenty recognizable as whatever they were supposed to be. Interplay, as they always did, worked in the timeline of the first six Star Trek films – I suspect CBS/Paramount must have licensed the original series, TNG, and DS9 separately, but I don’t know for sure. In the game, you are a cadet at Starfleet Academy, training to be a commander of your own starship. You are assigned a “crew” of other cadets pursuing other specializations, and these characters remain consistent throughout the game, which creates the game’s story. 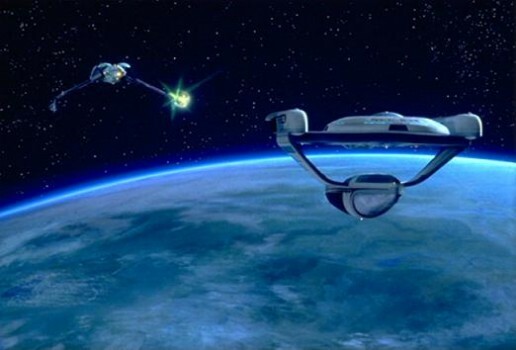 Aside from being able to chat with NPCs between missions, though, the main gameplay is the eponymous simulator, where you and your crew get to play at being in control of an actual starship, starting with a humble Oberth-class science vessel (that one that got blown up by the Klingons in Star Trek III) up to the refit Constitution-class to which the Enterprise of the films belongs. That’s the one. Yeah, the one in the foreground, about to be shot. Each mission has a variety of ways for you to gain or lose points on your grade, including branching dialogue choices and little mysteries to solve. Sure, you arm phasers and torpedoes often enough and engage in some pretty reasonable 3D dogfighting, but that should never be your first recourse. Perhaps taking a cue from Wing Commander (and this is not the only time Interplay takes a cue from Wing Commander), you are not forced to replay missions for falling short of a passing grade, though you’ll get progressively worse game endings if your grades don’t cut it. This is a game that took the action on the bridge and owned it, as much as the technology allowed, and the missions were complex enough to feel like legitimate challenges beyond just out-piloting the Gorn or Tholians or Klingons. Somehow, Interplay even managed to deliver an interface which didn’t feel completely inadequate. (Imagine, a simulator on the SNES with usable controls!) The point is, like Future’s Past, SASBS got that Star Trek could have action, but wasn’t always about action: considering that multiple companies got this very right, at least in principle, it’s a little astonishing to see how very far Trek games go astray only a few short years later. For the full effect, it’s worth checking out a video that shows it working. It’s a surprisingly worthwhile play for its time and context. A smattering of other games made it to the SNES and Game Boy, with some (including Future’s Past, though it got re-named to Echoes of the Past) getting ported to Genesis and Game Gear. But after 1994, consoles wouldn’t see another Trek game until 2000. (Perhaps more importantly, consoles wouldn’t see another good Trek game…ever.) But what was happening on the PC all this time? Well, a number of things – some of them very, very good. But for this segment, let me leave off with a glimpse at Simon & Schuster’s return to Star Trek gaming: choose your own adventure video game…things. The first was Star Trek: Klingon (1995), which had a lot of…talking in Klingon. 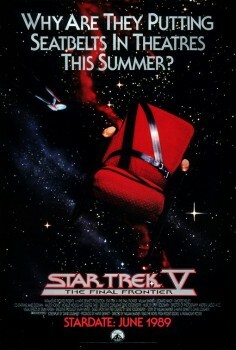 The second was Star Trek: Borg (1996). Seeing these games on the shelf at Circuit City mystified me, but I never got to play them. They had lots of allure: each used some supporting characters from the series, like Gowron and Q, and sported reasonable production values, not to mention actually having the original actors for those big roles. Thanks to someone or other, though, the video from each (with branches) is available on YouTube so that I can see all the things I missed! Which is to say…not much. 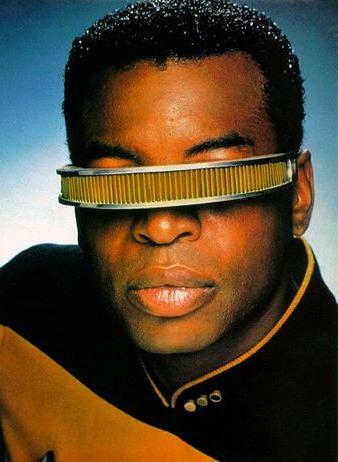 Until next time, enjoy Star Trek: Borg. I remember Future’s Past. Wow! It’s been a long time since I thought about it, but I remember renting it a few times. It does feel like Star Trek, but, at the same time, it’s befuddling. Or at least it was to my young mind at the time, but, looking at those shots of the interface, it may have been genuinely befuddling. The hardest part of it was figuring out the navigation system, I think, though looking back it was a fairly straightforward (if overly complicated) alphabetical affair. Future’s Past is definitely not tailored for a young audience, though. I played it on an emulator a few years ago and found it much more comprehensible. At least it didn’t require you to reference some esoteric clues in the manual like 25th Anniversary on the NES did. Oh man, I remember that very first Star Trek game. I played some port of it with my Dad, on our Apple II+, circa… a million years ago. 1981 maybe? I think the next (and last) ST game I tried to play was A Final Unity, which I’m guessing Dix will reach in Part 2. I say “tried to play” because my PC couldn’t run it and I had to return the game, which made me sad. Amazing to look back and realize how many games there’ve been in this franchise. Looking forward to more, Dix! Yes, A Final Unity could be a little unstable. Which is too bad. But yes, it’s probably the very first thing I’ll hit in Part II. Meanwhile, astute observers of Trek gamedom will note I’ve skipped something else, but there is method to my madness.